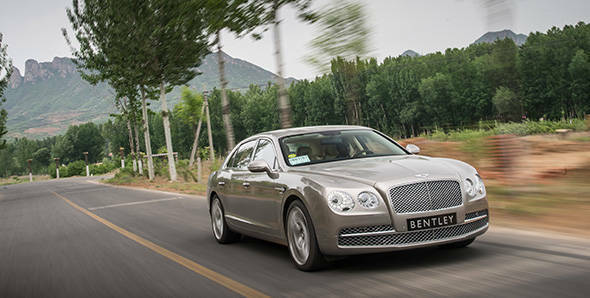 This is the new Bentley Flying Spur. Yes, it doesn't use the Continental prefix anymore but is still based on the same platform as the Continental GT. The car has been completely redesigned compared to the older model, though; every single panel is new and the outcome is a car that looks even more upmarket than before. It is also the most powerful four-door Bentley ever,making it faster than the flagship Mulsanne even. So what's new about the design? The car's face gets a wide chrome grille while it retains the signature twin headlamps.But, unlike its siblings and predecessor, the outer headlamps are now larger than the inner pair. The front fender features a new wing vent with a Bentley 'B' motif finished in chrome. The sides are sharply sculpted and merge with the well defined rear haunches. It gives the car a more purposeful stance and more character. The boot is lower and longer in the new model and is more limo like. The rear is unique; the tail lamps are now rectangular and feature a single LED cluster that resembles the oval exhaust. There is more chrome detailing on the boot lid too. Are the interiors any better? The design for one hasn't changed much, so stepping inside the Flying Spur instantly reminds one of the Continental GT, which isn't all together a bad thing because the GT's insides are still one of the best in this class of automobiles. However, compared to the previous generation Flying Spur, there are 600 new parts on the inside. These are difficult to spot, and even more cumbersome to list, so we will just take Bentley's word and applaud them for it. The Flying Spur comes with either a four or five seat layout. We drove the former, which is also the more luxurious option. It gets two individual rear seats and a full leather roof. One can also opt for a glass roof at no additional cost. The hand crafted seats all round use softer, more durable hide for added comfort and support, and the seats also come with massage function as standard; perfect really for those long drives. The underbody of the car runs insulation to dampen out the road noise while the front and rear windscreens are made of acoustic glass featuring a specially developed interlayer to reduce in-cabin noise even further. There are more comfort and convenience features too. There's a 10-inch display for the rear passengers to watch movies or surf the internet and while doing so, they can also sip on some chilled champagne courtesy the bottle cooler placed neatly behind the armrest. The Spur's party trick though is the TSR or the Touch Screen Remote. Occupants can access different systems from the climate control to the seat ventilation to the rear blind and even the trip computer from the backseat with the help of the TSR. And if you have a smartphone, the Bentley TSR app transforms the phone into an additional remote. Impressive! But is it as promising on the road as well? Achieving class-leading comfort and refinement was the priority during the development of this car and it is one of the reasons why Bentley engineers have softened the ride quality. The spring rates are softened up by 10 and 13 per cent, front and back, respectively for a cushier ride and the anti-roll bars are less rigid as well to improve wheel impact absorption. The suspension bushes are softer by 25 per cent to help reduce road noise and vibration. Our Flying Spur was the Mulliner edition and ran 21-inch wheels, but even then, the ride wasn't intrusive or uncomfortable. The ride will certainly be plusher on the 19-inch wheels which are offered as standard on the Flying Spur. Thankfully, the Spur isn't a softy to drive even though the focus clearly is comfort. The car's computer controlled suspension adds stiffness under hard cornering reducing both body roll and pitch, giving the driver enough confidence to push the dynamic envelope further with every bend and cross limits one wouldn't otherwise attempt in a luxury car. This car is also capable of crossing 300kmph, and so that it remains planted at such ridiculously high speeds, the ride height is automatically lowered in stages before the Spur hits this number. If needed, one can manually choose between four damper settings as well ranging from the soft Comfort to the hard Sport mode. Didn't you say this was the fastest Bentley ever? No. What we did say is that the Flying Spur is the most powerful four door Bentley, ever. Nonetheless, it still is tremendously quick. It retains the mammoth 6-litre twin turbo W12 motor from the previous model, but the engine now puts out 625PS of max power and a massive 800Nm of peak torque. And because all of this torque is available from as early as 2000rpm, the Spur is amazingly quick from the word go. It gets to 100kmph from a standstill in 4.6 seconds and maxes out at 322kmph. These figures make the Flying Spur quicker and faster than the Mulsanne. The engine is mated to a new 8-speed ZF transmission that offers quick (under 200 milliseconds) and seamless shifts. Power meanwhile is sent to all four wheels with a 40:60 rear-biased torque split. So grip, in dry or wet or even on gravel for that matter, is sensational. Well Bentley says the car is a cut above the regular luxury sedans like the Audi A8 and Mercedes-Benz S-Class. It definitely is a class higher but at the same time is positioned below other luxury four-doors like the Roll Royce Ghost while offering similar, if not more equipment. No prices or launch details for India have been confirmed so far but expect the car to be priced between Rs 2.4 to 2.5 crore. We also expect the Flying Spur to rollout on Indian roads by the end of this year.